Often we’re so close to our own businesses it’s difficult to name our unique qualities. Are your potential customers asking you to explain what you offer again and again? Are customers referring to you as a “best kept secret?” Employees might comment no one understands what’s great about the company. These are all indicators it’s time to reconsider your brand and message. 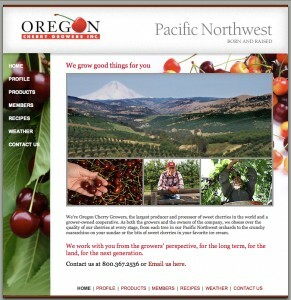 As a maraschino cherry producer, Oregon Cherry Growers’ products are viewed as a commodity. But as the only cherry producer/processor in the world owned by the growers, Oregon Cherry Growers delivers a maraschino that’s quality controlled from tree to processing. The result is a cherry with better size, texture and flavor. That’s a great story no one else could tell. Oregon Cherry Growers knew these unique benefits added value, but they didn’t have the messages to effectively share this significant benefit. Cascade Employers Association was often told by loyal members they were a “best kept secret.” Yet they’ve provided resources and HR-related services to employer members since 1947. The new messaging doesn’t focus on the “stuff” (products and services). Instead it addresses the context of how Cascade works with members. Those working relationships set them apart from the competition. A brand refresh updated the overall look and feel. Then new messaging on internal posters, pull-up banners for trade shows and business cards added consistency. The unique business cards use a series of different messages on the back. And a refreshed website incorporated new colors, fresh style and rotating messages. You can see the examples of our work on our website. Answer honestly … how’s your marketing message? In this rapidly changing business climate, it’s important you examine your marketing efforts and answer a few critical questions. It might be time to consider a brand refresh. Have your marketing messages kept up with evolving products and services? Are current and prospective customers still responding to your messages? Are you sharing the story of the benefits you offer? Are messages and materials synchronized? No matter your business or your audience, a clearer, focused message will work harder for you. It will position your company for growth, increased sales, and longevity. A brand refresh will build on who you are and how you’re perceived to position you for the future. If it’s tough to distinguish your message so people “get” how you’re unique, let’s talk. Our messaging hierarchy has helped public and private organizations like these examples and many others. Read more about messaging on our website. These clients have used messaging and a brand refresh to push their marketing forward and boost response. The messages resonate with their target audiences, tell their story, and distinguish their organizations from others with similar products and services. Are you ready to see bigger response to your marketing? To create a program that resonates and motivates your target audiences? Then it’s time for an optimized brand. Our e-book, 10 Steps to Optimize Your Brand, outlines the 10 practices that set the foundation for a marketing program that generates results. Download your copy below. It will help you be more effective as you plan, implement and manage your marketing program.